Who, where, when: Air Force (2-3, 1-1 Mountain West Conference) at Wyoming (1-4, 0-1 MWC), Saturday, 5 p.m. Mountain time (7 p.m. EST). TV: Root Sports (Tim Neverett and Sed Bonner have the call; check here for channel listings). Gambling is illegal in most states: Air Force is a three-point favorite. Bad-luck Cowboys: For the second week in a row, Wyoming’s defense runs into the nation’s leading rusher. Last week, the Cowboys held Nevada’s Stefphon Jefferson to 78 yards on the ground — not enough to stop Nevada from a 35-28 overtime win, but enough to knock Jefferson out of the top spot. 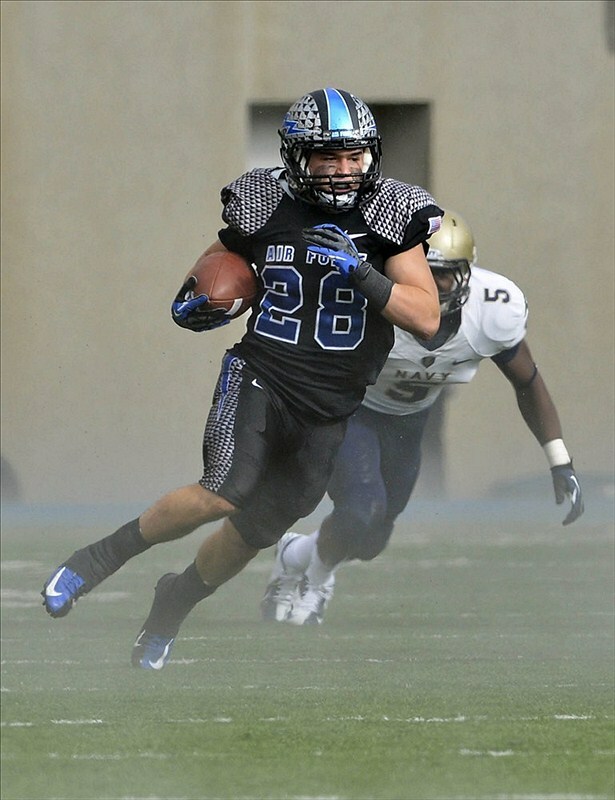 Air Force senior Cody Getz took over, entering Saturday’s game averaging more than 177 yards per game. More options: Nevada was able to pull out the win by putting the ball in the air — 438 yards passing, capped off by a 24-yard game-winning TD pass in overtime. Air Force senior quarterback Connor Dietz hasn’t been asked to throw much — he’s had just as many pass attempts (56) as he’s had rushes. But if the Cowboys slow down Getz like they slowed Jefferson, the offense will have to come from Dietz — on the ground or in the air — unless running backs Mike DeWitt (3.4 yards per carry) and Wes Cobb (3.5 ypg) can get in gear. Don’t keep it close: As Dave Ramsey at The (Colorado Springs, Colo.) Gazette points out, Air Force has lost to Michigan, UNLV and Navy this year by 16 points. Total. And as Ramsey’s piece outlines, close games have been a problem for Troy Calhoun’s teams throughout the head coach’s tenure. One surprise issue for the Falcons that can lose (or cause) close games — senior kicker Parker Herrington, on a number of preseason award lists, is 1-for-6 on field goals this year. Wyoming’s had its share of trouble in close games this season, losing to Nevada, Cal Poly and Toledo by a total of 12 points, but it did manage a road OT win at Idaho, 40-37, on Sept. 22. One-man band: Wyoming sophomore quarterback Brett Smith is ninth in the nation in total offense, with 336 yards per game, including almost 300 in the air. The Cowboys as a whole average 388.2 yards per game. Instead of the run-first approach used against Navy, Air Force will have to focus on receiving threats Chris McNeill and Dominic Rufran, both averaging better than 15 yards a catch. Another possible threat, wideout Robert Herron, has nine catches this season, four for TDs.